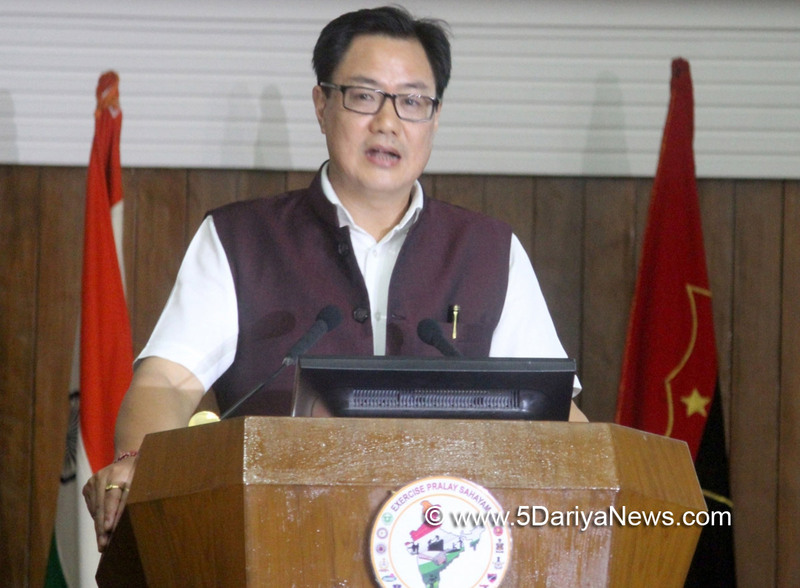 The Minister of State for Home Affairs Kiren Rijiju addressed at the seminar “Pralay Sahayam”- “Humanitarian Assistance and Disaster Relief” held at College of Defence Management in Secunderabad Cantonment today. The exercise is for all agencies involved in search, rescue and relief operations during natural disasters, to interact and evolve a seamless and optimized Disaster Management Strategy. Speaking on the occasion, Shri Kiren Rijiju said that Disaster resilience is the collective responsibility of all stakeholders, including Government, business communities, non-government sectors and individuals. He commended the role of Armed Forces in Disaster Management and highlighted the challenges faced by Southern Command in addressing natural disasters. In his welcome address, Lieutenant General PM Hariz, General Officer Commanding in Chief (GOC-in-C) Southern Command said that Hyderabad has been chosen for the exercise to suggest measures to enhance operational preparedness for Humanitarian Assistance and Disaster Relief (HADR) Operations.Mohammad Mehmood Ali, Deputy Chief Minister, Telangana State, welcomed all participants to the Seminar and emphasized the significance of addressing disasters on priority. Shri BR Meena, Special Chief Secretary to the Government of Telangana in Revenue and Disaster Management Department and Dr B Janardan Reddy, Commissioner GHMC who spoke on Disaster Management Plans of Telangana in general and urban flooding in Hyderabad also participated in the seminar. A Table Top Exercise, based on the theme of ‘Urban Flooding in Hyderabad’ was conducted which simulated the contingencies and criticalities emerging during a flooding situation and brought to fore the response of all agencies at the National and State level and included the role of Media, NGOs and other contributing agencies.